Be sure to check out these specialized workshops. Library will be open noon until 5pm on October 15. Published by the Indiana State University Alumni Association, “The Story of Sycamore Sam” will be on sale Saturday outside Memorial Stadium during “Tent City” in conjunction with ISU’s homecoming football game. Author Brian Hasler is a 1980 ISU graduate who currently serves as special assistant for external relations in the office of ISU President Dan Bradley. The book will be available at Homecoming’s Tent City. Hasler and illustrator Angela M. Gouge will be available to sign copies. The book will also be available soon at the Barnes & Noble/ISU College Bookstore in Terre Haute. Book readings, live illustrations and signing events are also planned in the months to come. The National Park Service and George Rogers Clark National Historical Park staff have invited Cinda May, Chair of Special Collections and director of Wabash Valley Visions & Voices Digital Memory Project, to participate in a two-day workshop to discuss long-term interpretive needs for the historical park and its resources. The workshop, which is scheduled for October 19-20, 2011, will be an interactive discussion among a diverse group of stakeholders to determine the resources, interpretative themes and stories, and challenges and opportunities in the area of interpretation in order to prepare a Long Term Interpretive Plan. The plan will identify an effective and efficient interpretative program that achieves management goals, provides appropriate visitor opportunities, and facilitates desired visitor experiences. Congratulations, Cinda! 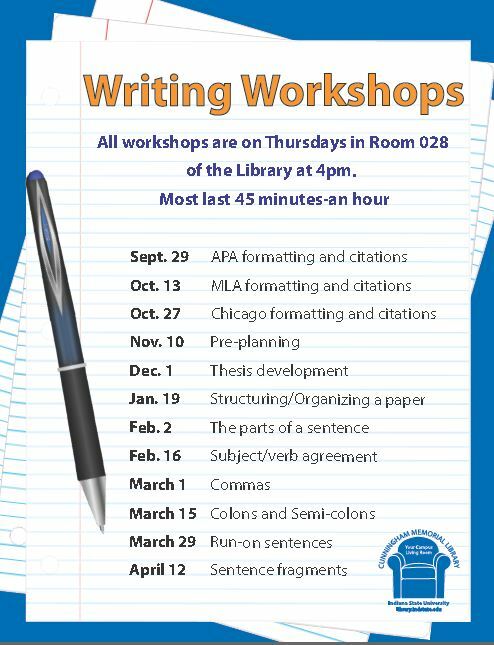 The Writing Center will host a Writing Workshop this Thursday in the Library’s meeting room on the Lower Level (028) from 4-5 pm. The topic will be MLA citations and formatting. This presentation, like all the Writing Workshops, is open to anyone interested in improving his/her writing skills. Rolland McGiverin has published LibGuides in the following areas: Criminology, Psychology, Education, Interior Design, and Business/Economics. This brings our total up to 67. Indiana State University’s Cunningham Memorial Library and the ISU Foundation have announced the creation of the Arthur Cunningham Society. Named for the then Indiana State Normal School’s first librarian, who served from 1890 to 1928, the society offers alumni and others the opportunity to help strengthen the library’s resources, services and facilities. Through the society’s support, the library can continue to offer such services as being open 24 hours per day during Finals Week; “Extravaganza,” its annual welcome back to campus event; and the Authors and Artists Reception that recognizes faculty research and creativity, Comer said. Peggy Hazledine Apgar of Terre Haute, Cunningham’s granddaughter, said her grandfather loved knowledge and books and believed in a strong library program. Cheryl Blevens, reference/instruction librarian, said the society has been in development for several months. Steve Brown, vice president for development with the ISU Foundation, said donations to the Arthur Cunningham Society will directly help students by providing them with more access to the resources they need to be successful at Indiana State. “The library is as important to today’s students as it was to students of Cunningham’s era,” he said. Under Cunningham’s leadership, the ISU library became the largest normal school library in the country. Cunningham also brought the Dewey Decimal System to St. Mary-of-the-Woods College, Rose Polytechnic Institute (now Rose-Hulman Institute of Technology) and the city of Terre Haute’s Fairbanks Memorial Library. 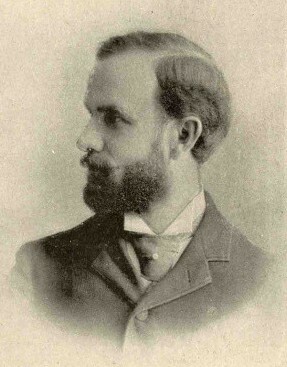 He also planned a library building at the Indiana State Normal School’s Eastern Division (now Ball State University). Arthur Cunningham Society members will be recognized on the society’s website and will be invited to special events throughout the year including Arthur Cunningham Day. Donors of $10,000 or more will have their names inscribed on a plaque in the library. Donations to the society should be made payable to the ISU Foundation and sent to 30 N. Fifth Street, Terre Haute, IN 47809. More information about Cunningham Memorial Library and the Arthur Cunningham Society is available at 812-237-8986 or ISU-CunninghamSociety@mail.indstate.edu. What is the place of women in sports and what is the place of sports in women’s lives across their lifespan? 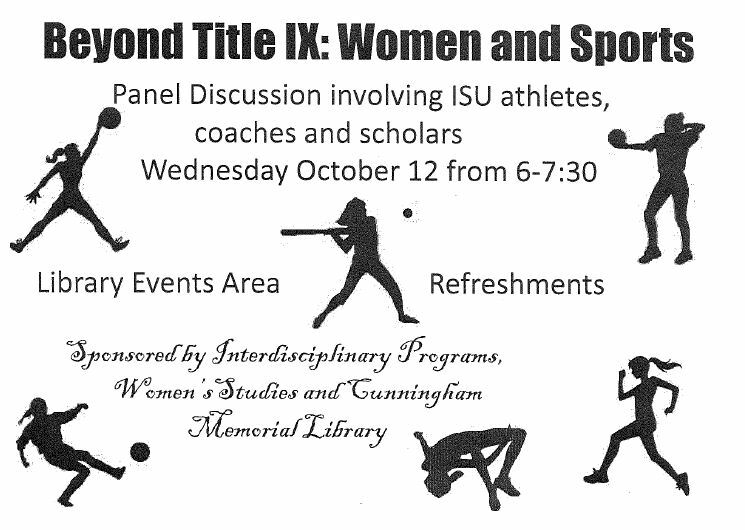 Join us, and some ISU athletes, coaches and scholars for a panel discussion on a range of issues related to women and sports. The program will be held Wednesday, October 12 from 6-7:30 in the Library Events Area. It is sponsored by Interdisciplinary Programs, Women’s Studies and the Cunningham Memorial Library.